Creating a garden mosaic: Could it be knitting for gardeners and a perfect winter gardening activity? 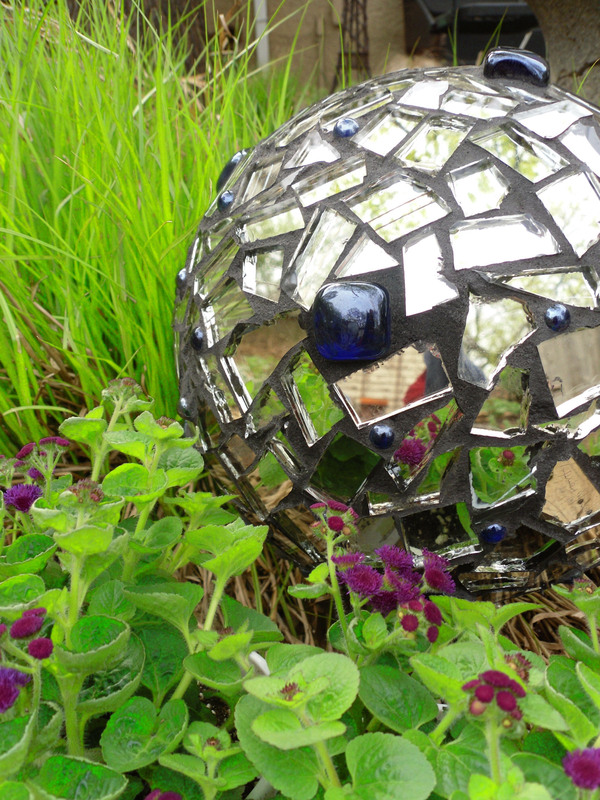 A bowling ball makes a great base for a garden mosaic gazing ball. Broken mirror pieces and blue marbles glued on and grouted do the trick. Leave a hole open to prop the ball on a dowel or stake pressed into the earth. The art and craft of mosaic seems to have suffered an identity crisis as of late — maybe a few too many uninspired stepping stones have popped up here and there and it’s been done to death — but I would like to encourage you to consider creating one for your garden. Mosaic is like knitting for the gardener. The gentle repetition and gradual crescendo to the end-product is calming and uplifting and the perfect activity for evening TV watching. Circles work well in garden design and decoration. 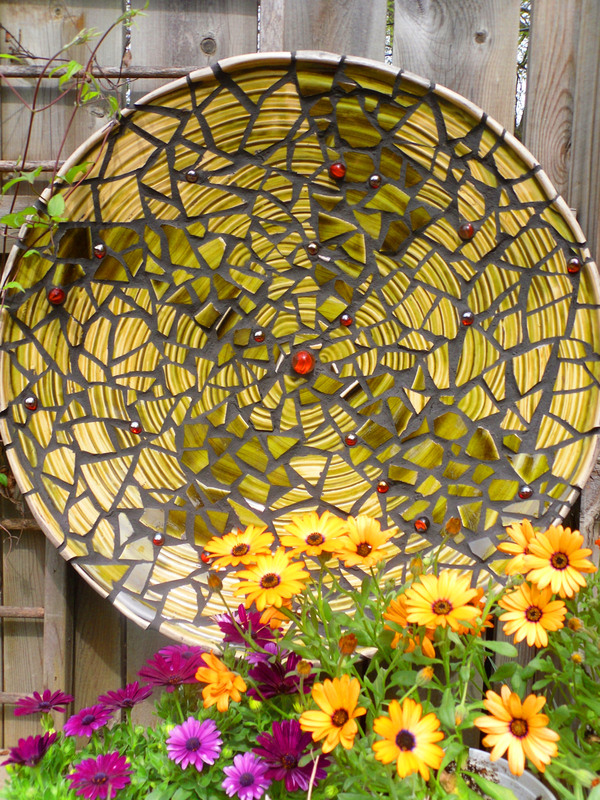 This mosaic garden plate was created using two separate broken-to-pieces platters glued and grouted on a large bamboo disc found at Ikea. P.S. Being a potter grooves well with being a gardener. The process is pretty simple: break stuff up and put it back together. It’s an incredibly satisfying DIY project with dramatic results. The placing of the pieces is extremely calming and what could be more fun than smoothing on the grout? The art and craft of mosaic is a fun and forgiving activity. In a nutshell, you break something up, then reassemble it in a pleasing pattern of your choice and secure it with grout, like in your kitchen or bathroom. Mirrors and pottery of various sorts are common materials for mosaic, but anything that will set in grout will do. Glass marbles always work, as well. If you are breaking up materials, always wear protective safety goggles and gloves and be all-around careful. Tacky craft glue works great for affixing your pottery, mirror, or glass pieces to the surface of whatever you are working on. Nearly any grout will do, with a special nod going to the pre-mixed varieties for making the process so much easier. Lean towards darker shades to make your mosaic pieces pop. A coat of polyurethane will help seal and protect the grout. Generally speaking, I keep mosaic pieces in more protected areas in the garden to preserve them as long as possible. 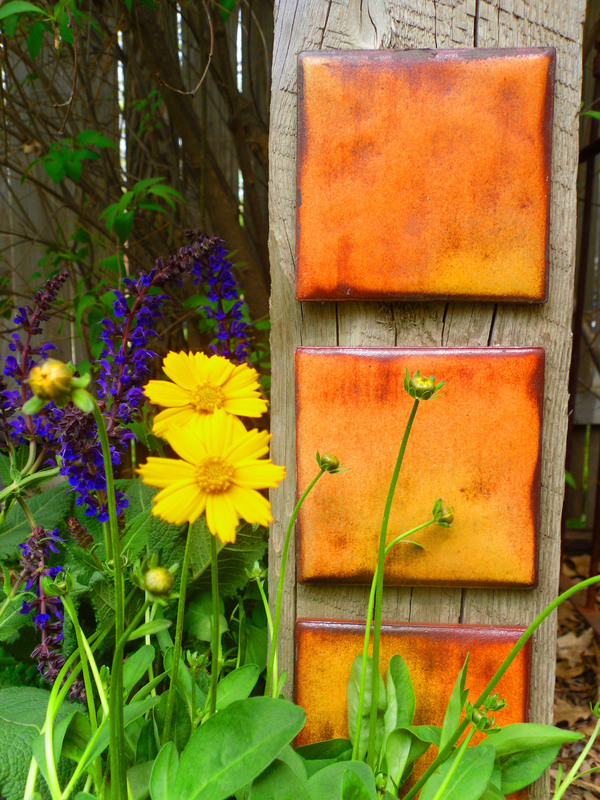 You don’t need to break up your tile to use it to decorate your garden space. Kitchen and bath tiles, attached to a 4 x 4 fence post with Liquid Nails or secured with small nails, add color, flair and visual appeal. Vibrant and richer shades, such as this rusty orange, stand out best in the garden and you will never go wrong with orange in accents and flowers. It’s a magical color. Coreopsis and salvia ‘May Night’ (in the background) are friendly flowers in the landscape.